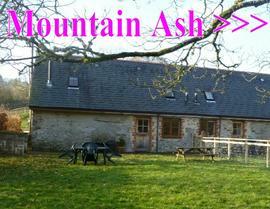 Mountain Ash has a large kitchen/diner, sitting room, two bedrooms and a bathroom. 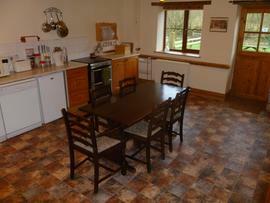 The kitchen/diner is fully equipped including dishwasher, washing machine, microwave, freezer etc. 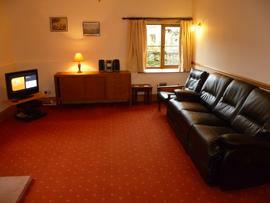 In the sitting room there is a colour television, video, books and games. Upstairs the bedrooms consist of a double room and a twin room with single beds. The master bedroom has tea making facilities and colour television. Both bedrooms have wash hand basins. There is also a bathroom with bath, hand wash basin, WC and shower. 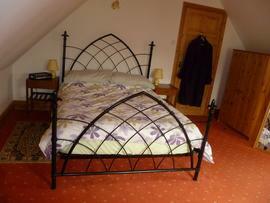 We provide all electricity, wood for log burner and full oil central heating in the price together with all bed linen. All you need to bring is your food and your towels! For guests with young children we can supply cot and high chair. There is a log burner in the sitting room, not needed to keep you warm but cosy for winter nights! The cottage enjoys its own garden to the rear overlooking the River Exe. 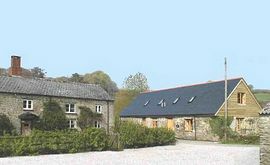 We are only 5 - 10 minutes walk from the centre of the picturesque village of Exford with walks straight up onto the moor from the cottage door. We also have stabling for horses (or cycles!). Exmoor provides an opportunity to enjoy the peace and tranquillity of the English Countryside and see amazing wildlife including Red Deer. We are only 5 miles from the beautiful south coast of the Bristol Channel with its magnificent cliffs, headlands and secluded bays and inlets. From Exford follow the road to Withypool for 250 metres. Where the road bends sharp right, follow our road straight on for 300 metres and Mountain Ash is on your left. £345.00 - £495.00 per week depending on the season. Short breaks may also be available so call for details. Open all year - arive after 4:00pm and depart by 10:00am.